What? One of the world’s largest international airport plans to relocate onto a tidal estuary to the east of London. Why? London residents have grown increasingly frustrated by Heathrow’s development and plans for a new third runway, which will increase noise in residential areas near the airport. Won’t it be mind-bogglingly expensive? Yes, the current plans for the massive airport, which will easily be the world’s largest with four runways and four terminals, will call for an investment of $63 billion (Rs 315,000 crore). Just for comparison, the Delhi airport expansion is estimated to cost Rs 5,000 crore. So, why invest? 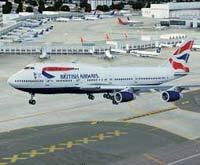 Heathrow’s endemic congestion has meant that British Airways cannot expand operations to keep up with rivals and limited slots at Heathrow are becoming very expensive. Recently, pairs of primetime slots have been sold for $10 million (Rs 50 crore) apiece. When will this airport be built? Don’t bet on it happening anytime soon. The planned investment has balked government and investors alike, but everybody agrees that Heathrow needs a makeover.